This machine measures the current of light bulbs for automobile lighting equipment and checks for wiring errors simultaneously. Visual inspection is difficult nowadays as the functions of lighting equipment are becoming more and more complex. 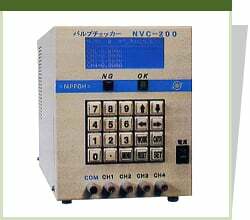 NVC-200 provides many functions that will meet your demands. It will certainly help improve the quality of your products. By pre-setting the conditions for each work, all the settings change automatically when the user simply enters the work number. No more complicated steps are necessary. When the work does not match the pre-set conditions, it is determined as NG and the lamp monitor activates as the signal is sent out. The same applies when the result is OK.
Best suitable for both low-volume and high-volume product. Unbelievable price on Bulb Checker NVC-200 in Seremban (Malaysia) company Bestever Enterprise.